← Outlet-101 New website launch!!! Well its 93 days till the British Olympics kick off!! Its going to be total media blackout on the Tv so if your not wanting to watch it we suggest you start filling up your TV planner with things to watch as its going to be on 24/7!! Today Team GB will find out their Olympic football opponents with the draw held at Wembley. 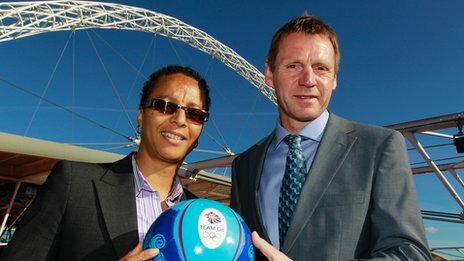 Stuart Pearce’s men’s side and Hope Powell’s women have been named among the top seeds for the tournament. In the men’s competition there are 16 teams, with Senegal claiming the final place after a play-off win over Oman on Monday, and 12 in the women’s. COME ON GB!! Sides know the dates of their three group games but will discover their opponents at the draw, hope we draw some good teams!! Britain, world champions Spain, Brazil and Mexico were named by Fifa as the top four men’s seeds on Monday, while GB, world champions Japan and defending champions the United States are the three women’s seeds. Our GB women will take part in the first match, at the Millennium Stadium in Cardiff on 25 July – two days before the Games opening ceremony – with the finals at Wembley on 9 and 11 August. The draw today will be hosted by Match of the Day presenter Gary Lineker and will be live on the BBC Sport website. During the competition, matches will be played at Hampden Park (Glasgow), Sports Direct Arena – to revert to St James’ Park during the Games (Newcastle), Old Trafford (Manchester), the City of Coventry Stadium (otherwise known as the Ricoh Arena), the Millennium Stadium (Cardiff) and Wembley (London). The 16 teams in the men’s competition will be split into four groups, with the top two in each group advancing to the quarter-finals. Our GB men will begin their campaign at Old Trafford on Thursday 26 July, followed by a game at Wembley on Sunday 29 July and their final group match at the Millennium Stadium on Wednesday 1 August. More than 50,000 tickets have been sold for the opening game at Old Trafford and a double-headed friendly is expected to take place ahead of the tournament at Middlesbrough’s Riverside Stadium. The Football Association has yet to confirm the line-up but GB’s men are thought likely to take on Brazil in the warm-up. It could take place on 20 July and may also feature the women’s team facing Sweden. Pearce is set to name his squad of 18 at the start of June, which must have 15 players born after 1 January 1989, wonder who will be in the line up!!!! David Beckham remains in the hunt for one of the three over-age spots, while Joe Cole, Scotland’s Steven Fletcher and Wales forward Craig Bellamy are also understood to be waiting on a place! I think it would be great to have David Beckham play for team GB he would be perfect to represent us! The final 18 will be chosen after the England squad for Euro 2012 has been selected, with no players who make the journey to Poland and Ukraine being eligible. The 12 teams in the women’s competition are split into three groups, with the group winners and runners-up joined by the two best third-ranked teams in the quarter-finals. After their Millennium Stadium opener, Hope Powell’s side will play again in Cardiff on Saturday 28 July, with their final group match on Tuesday 31 July at Wembley. Powell will be without regular England captain Faye White, who announced her international retirement last week! So watch today for the Live Draw Exciting Times!!! This entry was posted in Sports News!, Uncategorized and tagged Olympics. Bookmark the permalink.